It’s amazing that this is the second movie that I’ve seen with my boyfriend within a month. He’s not that much into watching movies from the big screen because he hates when you can’t pause it to do something or when it did not have a subtitle. LOL. He’s really smart, right? Thankfully, I did not even have to put too much effort in asking him to watch the fourth Pirate movie. He must actually like that much, the first three so it could be the reason. So for my movie reaction, any movie that has Johnny Depp in it, is really good. I simply love him. Not many people can act silly drunk and still look so hot and yummy so he must be doing something good, right eh? 🙂 When I saw the movie, I can’t say that it was better than the first three…but not that much. Somehow it’s the same (from the first three) but it’s different. It’s the same because the previous some of the previous actors where playing the same characters but it’s different because they were not pulled by the same plot compared to the first three. 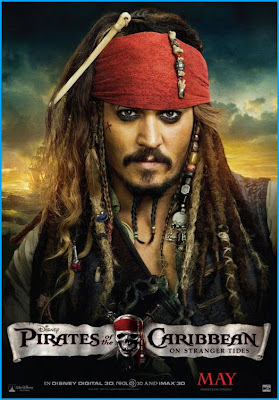 The first three movies felt as if it’s really a trilogy, as in best to watch it together so you can find the continuity; while On Stranger Tides, the movie stands alone. I could watch it and still understand what was going on. On for the ending, it felt like there’s a finality, like I should not expect to get a part five…or something like that. Overall, I still find the movie a “must see” this summer. Maybe you would enjoy it more if you go out with your girlfriends then later spazz about Johnny Depp’s acting and hotness. I’m giving it 3.5 out of 5 stars. I’m so lucky to meet THE Captain Jack Sparrow in Hong Kong at Madame Tussauds last 2009…hehehe…Isn’t it cool? LOL.